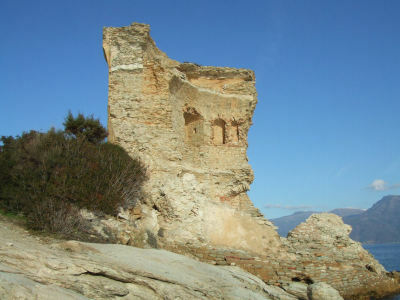 The name Martello is a corruption of the word Mortella, which refers to Mortella Point on the Mediterranean Island of Corsica. Martello Towers were first encountered by the British, during their efforts to conquer Corsica during Napoleonic Wars. The British encountered extreme difficulties during a seige on a medieval tower. The combined firepower of HMS Juno and HMS fortitude of over 100 cannons could not destroy the Tour de Mortello. Although a landward infantry assault would eventually capture the tower, the tower's garrison of some 2 dozen soldiers and cannon proved effective at holding back a much superior force. The British were so impressed by this resistance that they copied the simple concept of the tower for use in their own defensive systems, particularly along the south coast of England during the Napoleonic era, and later in British North America. The towers were consequently called Martello Towers. A Martello tower is typically a squat, round, thick-walled tower with guns mounted on a flat roof. Their purpose was to provide concentrated fire on ships, thus repelling an enemy landing. They were capable of withstanding a siege of considerable duration. Despite being in eastern Canada and thousands of miles away from the conflict, Kingston was well fortified during the Oregon Crisis. Murney Tower is one of four martello towers to be built in Kingston. The remaining towers are Shoal Tower, Fort Frederick, and Cathcart Tower. In addition to the martellos, Kingston is also protected by Fort Henry and Market Battery. This network of defenses was built to defend the entrance to the Rideau Canal, as well as Lake Ontario and the St. Lawrence area. In 2007, the four Martello towers in Kingston; Murney Tower, Shoal Tower, Cathcart Tower and Fort Frederick Tower, became part of the Rideau Canal and Kingston Fortifications World Heritage Site - the 14th World Heritage Site in Canada and the only one in Ontario. 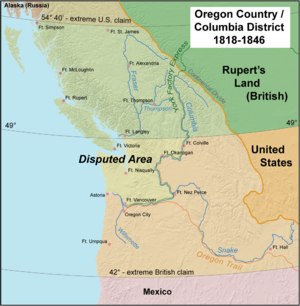 In the 1800s both the British and the Americans were sharing what was then known as the Oregon Territory. This territory covered what is now Oregon, Idaho, Washington, and the Canadian coast up to Alaska. The most northern boundary of Oregon Territory was the latitude of 54 degrees, 40 minutes. James K. Polk, the Democratic candidate for the US Presidency at the time, exploited the desire for American expansion with his campaign slogan, “54 40 or fight!” 1 As tensions rose, the British had to prepare for another potential war. Murney Tower along with the other Kingston fortifications were built to defend the area from an American attack. Fortunately, Polk was willing to compromise and the boundary was settled at the 49th parallel without any violence. Murney Tower was thankfully never used in a conflict. For years it was used as a barracks for soldiers and their families. Eventually in 1885 it was abandoned by the military and fell into disrepair. During this time the tower also attracted looters. Almost all the brick on the main floor was stolen. Thieves also managed to make off with a 1000lb cannon. The danger of not maintaining the tower was revealed when, in -- -- , a major windstorm blew the roof right off the tower. Tragically, the roof killed a small boy who was in the park across the street from the tower. After the tragedy that occurred during the windstorm, it became apparent that something had to be done to maintain the tower. In 1925, ownership of the tower passed from the hands of the military into the hands of the Ministry of the Interior (later Parks Canada) under the condition that the Kingston Historical Society use the space as a museum dedicated to the history of the tower. August 1, 1925 saw the official opening of the Murney Tower Museum by the mayor of Kingston and its Member of Provincial Parliament. It was Kingston’s first museum and today remains its oldest. Artillery, ammunition, and even everyday household items from the 1800s were on display as the museum opened. Some of these objects had been donated by residents of Kingston. Ninety years later, the museum still displays many of these same artifacts. Thanks to the dedication of the Kingston Historical Society, the museum has remained an important landmark, ninety years later.